I, Robot tells a story of the rise of robotics from the point of view of Dr. Susan Calvin, a robot psychologist, who is being interviewed after a long and eventful life about her experiences with different kinds of robots throughout the late 20th century and first half of 21st century, as she is telling about the past in about the year 2050. It is a science-fiction novel, with interesting characters and deep philosophical questions about artificial intelligence. The book is a compilation of short stories about different robots, all of which have for some reason played a part in Susan’s life. For example there’s a robot, who is a nursemaid for a small girl. The girl doesn’t want to play with other children, but rather prefers to spend time with one of the most advanced household robots of the time, but troubles arise when the girls mother decides that in order for her to grow up normal, they have to get rid of the robot, which leads to questions such as can a robot or artificial intelligence (AI) be someone’s friend, should or could it be treated as a person or as a household appliance? As time passes, there are more advanced robots developed – one who can read minds for example, or an AI that can build a spaceship for interstellar travel. 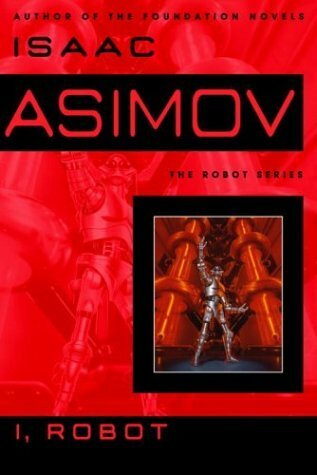 They aren’t random characters in the book, but rather every incident and robot raises questions, as they all have to obey the three laws of robotics, which Asimov constructed. That aspect makes the book a thrilling psychological piece, as the reader is following the robot psychologist’s thoughts and actions, and we see what kind of problems might arise. Certainly an enjoyable book, especially as one of the main human characters is a strong and smart female figure, who is in a lot of cases the one who comes up with a valid reasoning or solution for a situation. Although the collection was first published in 1950, and the stories themselves separately between 1940 and 1950, it doesn’t read as too implausible, although that level of technological achievement doesn’t seem to have been achieved just yet. I found it interesting, as some of the “robots” are in fact really powerful computers, but they still obey Asimov’s laws of robotics, most importantly the robots seem able of individual thought. Having just last week seen the movie Transcendence, I find myself thinking whether or not there will ever be such level of technology that could actually follow Asimov’s laws of robotics, and in case of the singularity (not the physical kind, but the technological where AI becomes smarter than a human brain) in the movie – is that an AI and could be considered a robot, or is it still a human and more like a cyborg although stuck in a computer? To get back to the book – it’s an excellent read, I’d highly recommend reading it. Apparently the 2004 movie “I, Robot” was inspired by this book, I haven’t seen it myself, but from what I’ve read of it, there are some of the characters who make an appearance in the book, but otherwise isn’t anything like the book.